Rebel Stakes 2014; Eight Sophomores Looking For Derby Points: The 2014 Rebel Stakes (GII) takes place Saturday, March 15th, 2014 at Oaklawn Park racetrack in Hot Springs, Arkansas. This race is open to 3 year-olds ready to run 1 1/16 miles on the dirt for a grand prize of $600,000. It is run annually in March and is the second leg of the Oaklawn three-year-old stakes races, the first being the Southwest Stakes and the third the Arkansas Derby. This years edition doles out points for the top four finishers with 50:20:10:5 on the road to the 2014 Kentucky Derby. Bob Baffert’s Hoppertunity (pictured above galloping), with 10-1 morning line odds, and jockey Mike Smith will break from post position #5 at Oaklawn Park in the Rebel Stakes on Saturday, March 15, 2014. Inaugurated as a Handicap race, the Rebel Stakes is now one of the prep races enroute to the annual U.S. Triple Crown series. On November 28, 2007, this (GIII) stakes race was upgraded to a (GII) by the American Graded Stakes Committee. The race has been run since 1961 and for once, at the same distance of 1 1/16 miles the entire span, shocker. The speed record as a Handicap race goes to Betemight in 1967 set at 1:40.80 and as a Stakes race, the winner is Vanlandingham in 1984 in 1:41.00. Most wins by a jockey are at 3 each for Larry Snyder, Pat Day and Mike Smith. Most wins by a trainer are five for Robert E. Holthus. 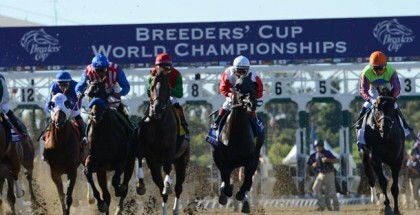 Last year this race was won by Will Take Charge for D. Wayne Lukas in 1:45.18. The 2014 Rebel Stakes is the 10th race of the day on a card of 11 with a post time of 6:04 pm, CST. It follows two stakes races, race #8 the Azeri Stakes (GII) for fillies and mares and race #9 the Razorback Handicap (GIII) for older males. 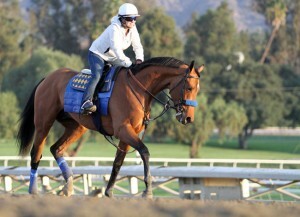 The half-brother to Executiveprivilege, Hoppertunity, looks to be Bob Baffert’s shipper here. You can bet, if B.A.B.’s is taking the time to ship him again, he has a chance to score some points. The Any Given Saturday/Refugee/Unaccounted For colt, just broke his maiden this year at Santa Anita on January 30, 2014 going a mile on the dirt. He followed that up on February 22, 2014 in the Risen Star Stakes (GII) where he shipped to Fairgrounds Racetrack in New Orleans. In that race he broke 11th, started in the 9 to 10 path and was wide most of the entire race. He was 2-3 wide on the first turn, 4 wide throughout, was reserved off the pace, urged along 4-5 wide, then 6 wide at the far turn, where he improved his positioning to finish fourth. The Risen Star Stakes was Hoppertunity’s third career start. Mike Smith ships in to jump on Hoppertunity here from the #5 hole. It looks like trainer D. Wayne Lukas is back to try and win the Rebel again with Strong Mandate vying for 50 points to add to his six. The son of Tiznow/Clear Mandate/Deputy Minister has a race record of 6:2:1:1. Last out at Oaklawn on February 17th going 1 1/16 miles on the dirt, he battled with Tapiture where he ran well but didn’t have the cleanest of trips. He got bumped leaving the gate, hit traffic around the first turn where he was four wide, then five wide into the stretch to finish second. They wanted him more forwardly placed but they just couldn’t get him into position. That was his first start for 2014 and it looks like he was just getting his feet wet after a 3 month layoff after he finished 3rd in the Breeders’ Cup Juvenile (GI) on November 2nd, 2013. Rosario gets the mount on Strong Mandate who exits door #4. The eye-catching maiden win of Street Strategy on January 30th was his first race around two-turns and the second of his career, both at Oaklawn on his home-track. In that maiden-breaking race the gray son of Street Sense/Spoken Softly/Notebook broke clear to establish the early lead, gave it up at the half to retake it on the second turn and drew out to win by 6 1/2 lengths. Prior he was second in his first start at Oaklawn on January 11th where he made a late bid and didn’t get up in time for the win. In both of those races he was ridden by Calvin Borel who is up again here and they exit from lucky #7. Trainer Randy Morse has put Street Strategy through a few 4f and one 6f work under Calvin and thinks his horse is ready to run. Kari’s Picks: Call me crazy but I’m really digging Hoppertunity in here to win the 2014 Rebel Stakes. 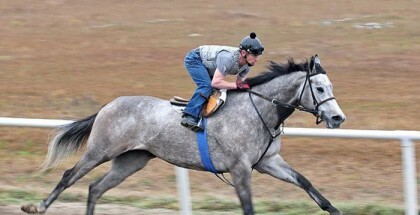 I think the jockey change and a better post position in a smaller field could be to his advantage. It doesn’t hurt that Baffert won this race three times in 2010, 2011 & 2012 and this could punch his ticket to the 2014 Kentucky Derby. Strong Mandate I also believe will run a better race than last time. He’ll have to run closer to the front and we’ll see if he can get a win at further than a mile. I don’t see too many horses in here that want the early lead and if Street Strategy with Bo-Rail decides to take it, watch out for the dirt in your mouth boys. For me, the win goes to #5 followed up with the #4 & #7 in no particular order. I may just play a $2 exacta box with these three. Good luck to everyone and safe ride. Interesting note: If Street Strategy and Hoppertunity go hoof-to-hoof here, could be the same battle as their sires did in the 2007 Tampa Bay Derby where Street Sense, in his first race as a three-year-old, won by a half-nose over Any Given Saturday in a track breaking time. Both Hoppertunity and Street Strategy also broke their maidens on the same day, January 30th, 2014 at different tracks. Food-for-thought. *A huge Thank You goes out to our guest handicapper Sigi Mendoza from last weekend! Between the two of us we nailed the top four in the Big ‘Cap with Game On Dude, Will Take Charge, Blingo and Mucho Macho Man. What a race! Sigi also mentioned a few South American horses running, Winning Prize and Suggestive Boy, who finished first and third in the Frank E. Kilroe race the same day. He also mentioned Brujo de Olleros who was scratched last weekend from the Gulfstream Park Handicap and was supposed to run in the Razorback on this card. 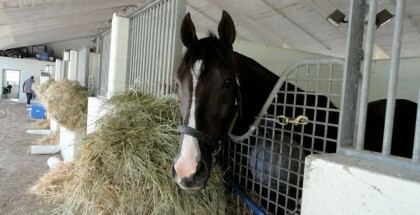 Unfortunately, he’s out with a swollen ankle and Team Valor hopes to have him in a race in the next couple of weeks. Bummed.